Jitka Vlasáková with Poodles shown in Prague, photo courtesy of Millano Photo. When I saw this gorgeous photo, all I could say was "wow"! Rarely in this country do we have shows where there would be this many "dogs of multi-colors" entered, plus I was impressed that all of them posed so nicely for the photo! There is one solid colored boy in the back, who happens to be parti-factored (his genes allow him to produce parti-colored Poodles) and he was bred by a well known Poodle breeder in the US, Kathy Esio-King of Jacknic Poodles. Lying down are Poodles owned by Tomáš Růžička (from left "Ivanhoe, Herro and Q"). And the beautiful boys sitting on the right are "ian" owned by Mirka Plevová and . And boys sitting on the right are Mirka Plevová ("Ian") and"Inkognito" who belongs to Hana Šimková. Interested in keeping up with this lovely party of parti Poodles? Eveyone except Hana Šimková can be found on Facebook. Adela says that the Poodles whose names begin "I" are sisters and brother, all out of Jitka´s lovely girl Nelly. Congratulations Jitka, on breeding such beautiful dogs! 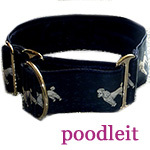 Adela, it is wonderful hearing from Poodles all the way from the Czech Republic and the show in Prague, thank you! Please forgive me for any changes in font size in this post---I had to copy and paste the names so I could be sure to get them correct! Even though my last name is Schlaginhaufen, I don't even know how to get my computer to put the accent marks above these lovely foreign names! Isn't Facebook fun? It allows us to get to know people from all over the world, some of whom become close friends. 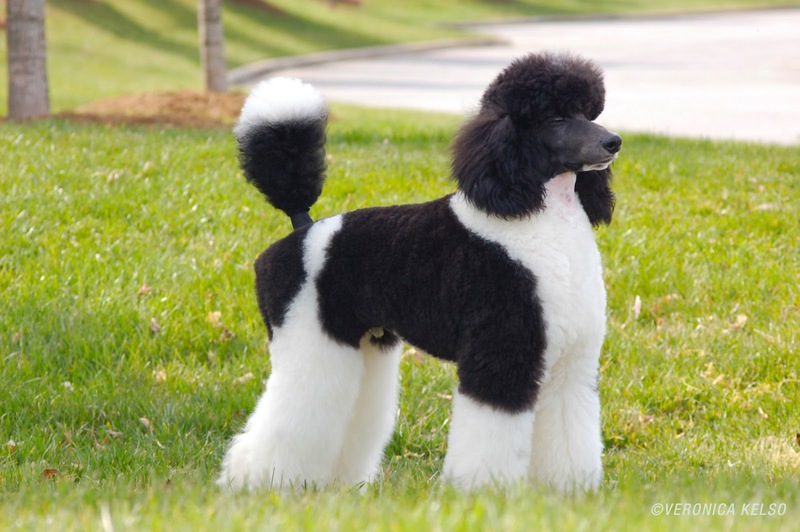 Because Standard Poodles are now plagued by so many health problems, it is more important than ever for ethical breeders to network and get to know each other. Thank you again Adela, for sharing this photo! I hope all of these Poodle owners will join us by clicking on the left hand side of this website : Follow the Poodle Blogger by email. : Remember, your email address will NEVER be shared with anyone, this website is totally for Poodle owners to share information and get to know other Poodle lovers. Hudson has now been here at our home approximately a month, but it took this sweet boy only a few days to totally worm his way into my family's heart! My birthday present from my husband this year was paying the expenses for me to go to a dog show weekend where Hudson's breeder flew in and showed him, then this lovely fellow went home with us. It was an extra special weekend not just due to getting to meet his breeder in person but also some good friends of ours, the Kelso family whom we have known for over 15 years, came to the dog show on Saturday to visit. Prodigy's Content of Character "Hudson"
Nest to the wonderful time spent with friends, perhaps the most special birthday present I received was a photo shoot of Hudson by my friend Veronica Kelso. The one above is one of my favorites! If you enjoy seeing photos of Poodles (of all colors and varieties) and reading the occasional dog training article, please subscribe to this blog (it is completely free and we do not ever give out any email addresses, see the link " on the left hand side of the page and the posts will come directly to your email). I also greatly appreciate comments, however comments are moderated. This means if you post an anonymous comment whose purpose is just to link to your own website (it is amazing the ones like this that I receive, many linking to offensive sites, others linking to the type breeders I cannot recommend, such as those who breed Poodle mixes and sell them for expensive prices) - I will not publish it. You don't have to use your full name, but please, if you are going to take the time to comment, make it about the blog or the post you are commenting on. If you do, even if you comment negatively if you don't like something I have written, I WILL publish it as long as no profanity is involved and as long as you are not trying to promote something of which I don't approve. Again, you can use your name or just "Jane Doe", doesn't matter, what matters is the purpose and content of your comment. Although Blogspot requires an email address when you comment, it will NOT show up at any place on the site, it is totally private. As far as other website links, if you are an ethical dog person (such as a breeder who does health clearances or someone who sells dog products and your site appears to be a valid site), I don't mind your link at the end of your comment. But spammers beware, your comment is not going to make it on to this blog so please don't waste your time! And breeders, if you don't know me personally, it would be nice if you take a moment to email me then I am more likely to publish a comment where you include your website. 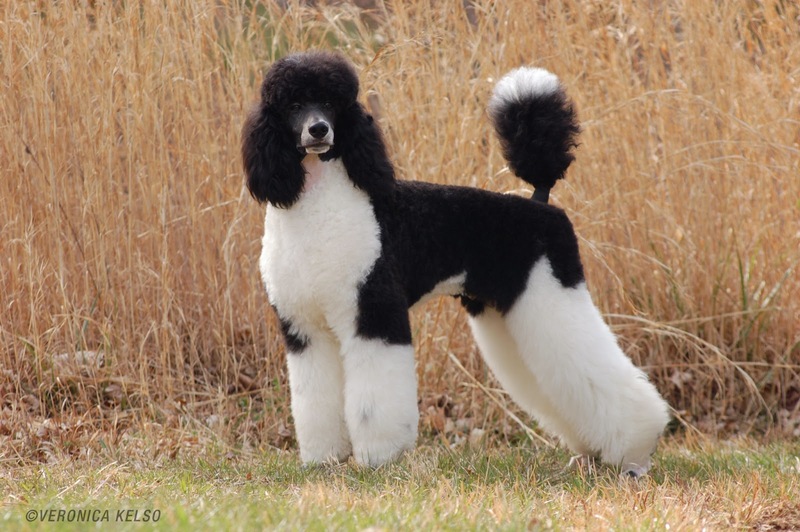 Poodles are very dear to my heart, and I try to recommend only breeders who I know have the breed's best interest at heart. I personally am not a breeder but am often asked for referrals to a good breeder or a reputable rescue when someone is looking for a Poodle. But back to the birthday presents, thank you everyone! Best of all, Hudson will always be linked in my mind to that fabulous, fun birthday weekend. Thank you to my wonderful husband Rick, and to the Kelso family (Veronica, Johnnie, Peter and Maria) plus Veronica's sweet Mom Cleeta who came up to visit and to Veronica for her gift of her wonderful photographs (and a yummy chocolate birthday cake too!). I could go on and on but won't bore you with my non-dog related presents. And many thanks to Hudson's breeder, Heather Bryan (Prodigy Poodles) for showing Huddy to a Best of Breed Parti Poodle win and getting him halfway to his UKC championship at the Sunday shows! UKC Dog show folks, you will see more of this lovely boy in the future! And I look forward to meeting more wonderful Poodle folks like those I met at Hickory. Also, thank you for all the comments on Facebook about Hudson (to my Florida friend, Huddy says to tell you he forgives you that you have nicknamed him Peanut!) LOL, it kind of fits! He is a precious little peanut. All in all, best birthday weekend ever. God is good.